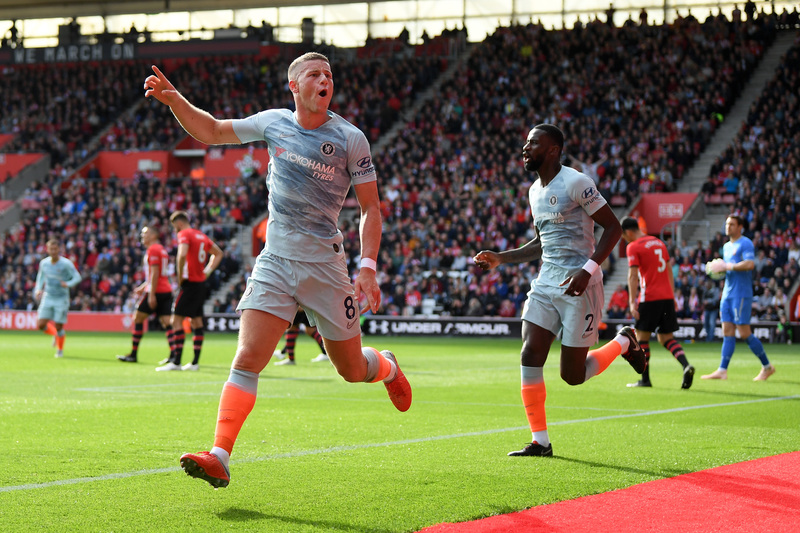 Chelsea eased past Southampton on their trip to St. Mary’s Stadium on Sunday afternoon, recording their sixth win in the Premier League. Eden Hazard opened the scoring in the first half, while Ross Barkley and Alvaro Morata added to that on the second. Maurizio Sarri’s side enjoyed plenty of the ball in the beginning of the game, but the first real chance came for the hosts, as Danny Ings got to the end of a Nathan Redmond cross, but struck it well over the bar from close-range. Southampton won themselves some momentum over the chance, but Chelsea turned the game around quickly. Olivier Giroud was fouled inside the penalty area, but the referee saw nothing in it. Eden Hazard found another way for the opener though, as Ross Barkley stole the ball from a Saints player and quickly played the Belgian through on goal. Hazard made no mistake from the edge of the area to give Chelsea the lead after 30 minutes of play! Chelsea kept the hosts quiet through the first period, and without much of an effort Chelsea found two more goals on the second. After an hour of play Ross Barkley nodded in a lovely scissor-kick cross from Giroud for his first ever Chelsea goal, and Alvaro Morata came on from the bench to kill the game off with a chipped finish from Hazard’s assist in stoppage time. Chelsea recorded already their fourth clean-sheet of the campaign, and it was very much thanks to some huge saves from Kepa Arrizabalaga. The new number one of the club made two world-class stops from a few long-range efforts, and had no troubles dealing with the rest of the four shots on target from Saints. The Blues will face Manchester United next once the upcoming international break will be dealt with. Top of the league for now! COME ON CHELSEA!